Approx size 20cm x 7cm. BMW M SPORT BOOT BADGE. 100% Easy installation, self-adhesive tape is included with the badge. Compatibility: All BMW. Size: 83 x 32 mm. 100% Easy installation, self-adhesive tape is included with the badge. Vinyl sticker decal with adhesive. Cutted on a automotive grade vinyl. Cutted with original ROLAND plotter with BEST Possible Quality! OEM font used unlike other generic offerings on eBay! 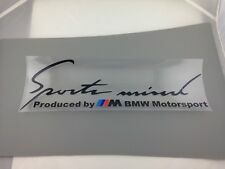 These are Vinyl Decals professionally cut to fit perfectly on your BMW emblems, they are NOT 3D Badges. You also acknowledge that this is not an official BMW Product and is a custom made product produced using the highest quality vinyls and printing technologies. 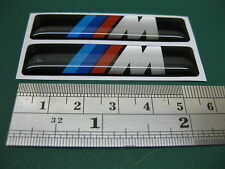 BMW M SPORT SMALL WING BADGES. 100% Easy installation, self-adhesive tape is included with the badge. Compatibility: All BMW. Size: 45 x 15 mm. Material: ABS. This is an 82mm logo from front and rear bumper of BMW. BMW M Performance Windshield Sticker. High quality stickers decal. 100% Easy installation, self-adhesive tape is included with the badge. BMW Part number: 51 14 7 179 198. Compatible with all BMW Models - 1 2 3 4 5 6 & 7 Series - M3 M4 X3 X5 Z3 Z4. Simple peel and stick installation. BMW BADGE VINYL WRAP KIT Carbon Fibre black. You also acknowledge that this is not an official BMW Product and is a custom made product produced using the highest quality vinyls and printing technologies. Clean your application area with detergent. Adhesive on the back, easy to install by peeling and pasting. Universal for all cars. The wheel centre cap base is made from a High Strength ABS plastic (PA6-MX. have a different sized wheel centre hole. Free set of 4 M Stickers. ). 2x 'LOW BMW 1-Series (5-door) outline' vinyl stickers models from 2004-2011 Made from high quality 7-8 year vinyl Standard Size : 14 cm (140mm) Length Standard colour : WHITE (you will recieve 1x car facing left and 1x right, unless you state otherwise) These can also be applied inside window. Want a Different colour or size? If you want a different colour and size then please leave a 'note during check out (note to seller) or send us a message after purchase If you don't let us know then the stickers will be sent in the standard size and colour as seen at the top. PLEASE REFER TO THE BELOW CHARTS FOR ALLOWED COLOURS AND SIZES These are the sizes available for this sticker. > 1x Carbon Insert for the Trunk Badge. -> 1x Carbon Insert for the Hood Badge. (hood, trunk, rims and steering wheel). -> 1x Carbon Insert for the Steering Wheel Badge. CARBON STICKERS for BMW BADGES. 2x 'LOW E91 Touring' outline vinyl stickers Made from high quality 7-8 year vinyl Standard Size : 14 cm (140mm) Length Standard colour : WHITE (you will recieve 1x car facing left and 1x right, unless you state otherwise) These can also be applied inside window. Want a Different colour or size? If you want a different colour and size then please leave a 'note during check out (note to seller) or send us a message after purchase If you don't let us know then the stickers will be sent in the standard size and colour as seen at the top. PLEASE REFER TO THE BELOW CHARTS FOR ALLOWED COLOURS AND SIZES These are the sizes available for this sticker. OBMEM font used unlike other generic offerings on eBay! Bonnet Stripe Decals. Customise your vehicle with these bonnet decals. Choose from one of the colour options shown above. Included - 2 bonnet decals. Stick it down from one side to another and remove the application tape. 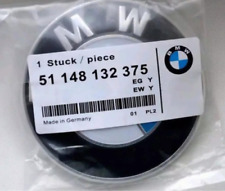 BMW M SPORT BLACK BOOT BADGE. 100% Easy installation, self-adhesive tape is included with the badge. Compatibility: All BMW. Size: 83 x 32 mm. 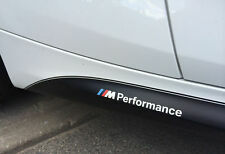 GLOSS BLACK BMW M140i CUSTOM REAR BADGE LETTERING 2 SERIES 3M UK FENDER BADGES. 1x BMW M140i gloss black. 2x Bmw Fender badges gloss black. OEM Badge size approx 170mm x 20mm. Peel off the front cover with the badge attached. 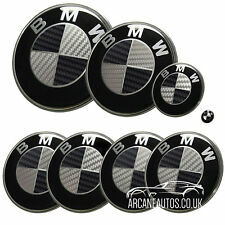 BMW M SPORT GLOSS BLACK SMALL WING BADGES. 100% Easy installation, self-adhesive tape is included with the badge. Compatibility: All BMW. Size: 45 x 15 mm. 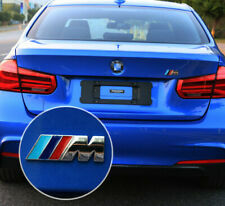 2x BMW M I-drive sticker decal logo. 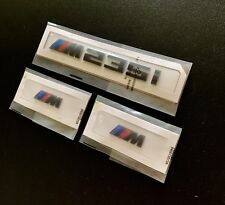 2x - BMW M STICKER(M LOGO ONLY). Compatibility: All BMW. 100% Easy installation, self-adhesive tape is included with the badge. Size: 1 x 0.5 cm. 82 x 32 mm l.
BLACK GLOSS EMBLEM BADGE Wrap Cover Skin. HIGH QUALITY BADGE EMBLEM WRAP VINYL FOR. THIS IS THE ORIGINAL BADGE WRAP DESIGNED AND TRADEMARKED BY WRAP YOUR BADGE! This is not a hard badge made from plastic. BLACK AND SILVER CARBON FIBER EMBLEM BADGE Wrap Cover Skin. HIGH QUALITY BADGE EMBLEM WRAP VINYL FOR. THIS IS THE ORIGINAL BADGE WRAP DESIGNED AND TRADEMARKED BY WRAP YOUR BADGE! This is not a hard badge made from plastic. 330cd 330ci e46 330 318ci 320cd 325. 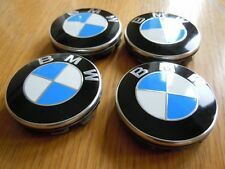 Genuine BMW Key Fob Remote Badge Logo Emblem. Adhesive emblem! Its how they are sold on BMW. BMW 5 Series. BMW 6 Series E63 / E64 till09/2005. BMW Z Series Z4. BMW X Series X5 E53 with all engines 3.0i / 3.0d / 4.4 / 4.6is / 4.8is. 3 Series (2005 - now): E90, E91, E92, E93, F20, F30, F31, F81. E81 E83 E86 E87 E90 E91 E92 E93 E94 X3 X5 Z3 Z4 Z8. - 1 Series (2004 - now): E81, E82, E87, E88, F21, F20. BLACK AND WHITE CARBON FIBER EMBLEM BADGE Wrap Cover Skin. BMW ///M Performance Side Decals This listing is for a pair of ///M Performance Decals! Made from premium vinyl, 10 year grade materials. Important: Turnerco Stickers was set up to supply automotive enthusiasts with great decals. All the car silhouette stickers you see on our site are not connected to any motor manufacturer, they and are 100% Unofficial. None of the images are endorsed by any such motor manufacturer and we do not portray there giftware to be endorsed by any such manufacturer. All designs are original Turnerco designs and copyright belongs to Turnerco stickers. "E46 Mafia" sticker These stickers are made for and based on the BMW e46 M3 Coupe Standard Size : 18 cm (180mm) Length Standard colour : WHITE [Click here] (https://contact.ebay.com/ws/eBayISAPI.dll?ContactUserNextGen&recipient=turnerco-custom-car-stickers) to send us a message If you don't let us know then the sticker will be sent in the standard size and colour as seen at the top. 5 Series (2004 - now): E60, E61, F10, F11, F07. E31 E36 E38 E39 E46 E52 E53 E70 E60 E61 E63 E64 E65 E66. - 6 Series (2004 - now): E63, E64, F12, F13, F06. BLACK AND WHITE CARBON FIBER EMBLEM BADGE Wrap Cover Skin. Tri colour badge with lettering in Black (20cm). - Our stickers are made from high quality outdoor vinyl and will last for 5-7 years if applied correctly. - Slowly remove the application tape, ensuring that the sticker does not lift with the tape. Important:Turnerco stickers was set up to supply automotive enthusiasts with great decals. All the car silhouette stickers you see on our site are not connected to any motor manufacturer, they and are 100% Unofficial. None of the images are endorsed by any such motor manufacturer and Turnerco do not portray there giftware to be endorsed by any such manufacturer. All designs are original Turnerco designs and copyright belongs to Turnerco stickers Here you will receive 2x car silhouette stickers These stickers are made for and based on the BMW E46 3-Series Coupe Standard Size : 18 cm (180mm) Length Standard colour : WHITE (you will receive 1x car facing left and 1x right, unless you state otherwise) These can be applied on the exterior or inside window [Click here] (https://contact.ebay.com/ws/eBayISAPI. 100% Easy installation, self-adhesive tape is included with the badge. 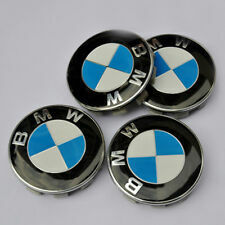 BMW M SPORT BADGES. Compatibility: All BMW. Size: 18 x 11mm. But may require extra glue! Mini one/cooper bonnet stripes. All of our decals are available in a range of colours. An easy to use set of instructions and illustrations are provided. 2x LOW E46 Compact outline vinyl stickers Made from high quality 7-8 year vinyl Standard Size : 14 cm (140mm) Length Standard colour : WHITE (you will recieve 1x car facing left and 1x right, unless you state otherwise) These can also be applied inside window. Want a Different colour or size? If you want a different colour and size then please leave a 'note during check out (note to seller) or send us a message after purchase If you don't let us know then the stickers will be sent in the standard size and colour as seen at the top. PLEASE REFER TO THE BELOW CHARTS FOR ALLOWED COLOURS AND SIZES These are the sizes available for this sticker. Important:Turnerco stickers was set up to supply automotive enthusiasts with great decals. All the car silhouette stickers you see on our site are not connected to any motor manufacturer, they and are 100% UnOfficial. None of the images are endorsed by any such motor manufacturer and Turnerco do not portray there giftware to be endorsed by any such manufacturer. All designs are original Turnerco designs and copyright belongs to Turnerco stickers Here you will receive 2x car silhouette stickers These stickers are made for and based on the BMW 1-Series E87 (5 door) Standard Size : 18 cm (180mm) Length Standard colour : WHITE (you will receive 1x car facing left and 1x right, unless you state otherwise) These can be applied on the exterior or inside window [Click here] (https://contact.ebay.com/ws/eBayISAPI. 2 pcs. BMW logo (Ø30mm) badge sticker. Domed 3D Stickers/Decals. 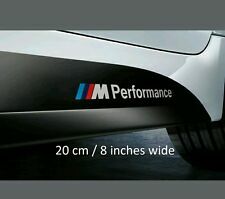 2 pcs x BMW M Performance (73x26mm) Logo/3D Domed Stickers.Chrome vinyl. 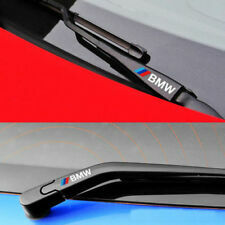 2pcs x BMW sticker Light Reflective! (Dia 30mm) Domed 3D Decals.